I like rollercoasters. There is something almost sadistic in enjoying the feeling of being hurled up, down, left and right at breakneck speeds. Twists and barrel rolls only add to the excitement. There is always great anticipation when you hear the clacking of the chain underneath the car as you ascend to the highest point of the coaster and prepare to make that first downward plunge. Unless you close your eyes, you can see what’s coming next for the rest of the ride. Life, businesses and the overall economy are much like a rollercoaster, only much less predictable. Leading Economic Indicators are statistics that are intended to provide insight of what’s coming next in an unpredictable economy. Leading Economic Indicators work on the general assumption of a cyclical economy (i.e., the economy cycles between growth and recession). The presumption is that bad economic times will eventually become good times, and good times will ultimately turn into a recession. Imagine a wave-graph. Leading economic indicators identify when things are going to get better and when it’s about to get worse. Unfortunately, the economy doesn’t operate in the smooth pattern of a wave graph. For many, the major U.S. stock markets are a leading economic indicator. The DJIA and NASDAQ will start to decline before a recession begins, and they will start to increase before economic recovery solidifies. This reflects the current economic conditions. The stock markets have rebounded tremendously since the lows of early 2009, but overall economic conditions are still rather perilous. Aside from the Conference Board’s official composite of leading economic indicators, people have others that are much less precise. Billionaire William Buffet says the most important indication of overall economic conditions is rail car loadings. At one time, former Federal Reserve Chairman Alan Greenspan, watched the sale of men’s underwear. Check out this Time article for 10 rather unusual, and somewhat humorous measures. You may read the Conference Board report, study the Bureau of Labor Statistics’ releases or measure blackouts of NFL games to gauge the strength and direction of the economy. Understanding economic indicators is one thing, but determining future economic activity is another. Businesses and economic activity is determined by people, and let’s be honest, we’re unpredictable. 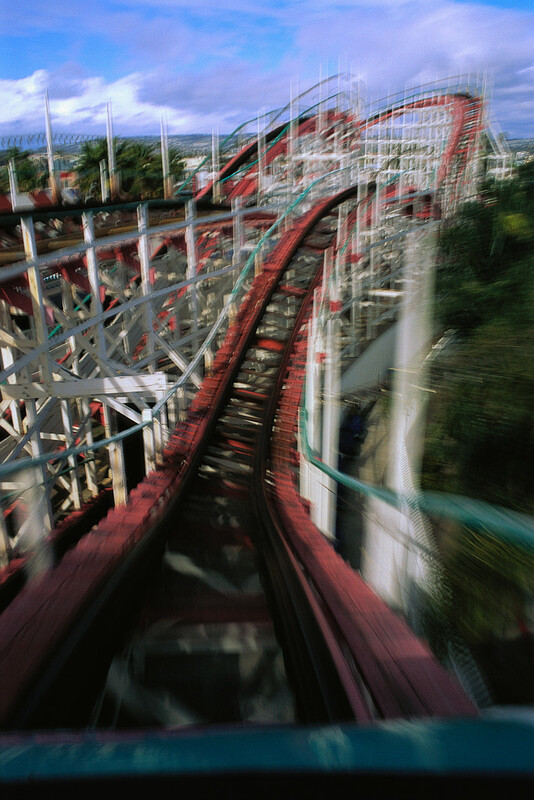 As exciting as rollercoasters are, life is much more thrilling because it’s completely unpredictable. Keep your eyes open and hold on for the ride.